After turning his inheritance into cash, the prodigal son sets out for a distant country. This country was definitely not Jewish, so it is obvious to the reader that he is among the Gentiles (goy or goyim pl., in Hebrew). There, the text says he squandered his money in wild living until all of it was gone. The prudent thing to do would have been to go home, back to his own people. But, he has broken the rules of the community and done the unthinkable, losing all his inheritance to the Gentiles. He knows the Kezazah (cutting off) ceremony awaits him unless he can find a paying job and recoup the money he has lost. 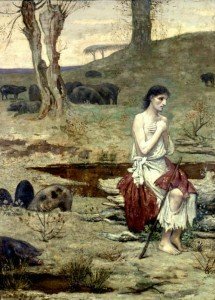 The prodigal hires himself out to a pig herder to feed his swine, but he is treated so poorly that he is about to starve to death. By going to a Gentile country and working for a gentile feeding his pigs, the story teller is saying, “He has gone as far away from his family and God as he can possibly get.” To feed pigs would have been the ultimate indignity for a Jew not only because the work was distasteful and they are dirty creatures, but God had told the Jews that pigs were unclean animals (Leviticus 11:7). Now there is no other option left but to go home and ask for employment as a hired hand working for his father. But, how can he possibly get his father to trust him and take him back? He has burned all his bridges behind him. It is at this point in the story that the most theologically damaging misinterpretation of this parable occurs. Luke 15:17 in the NIV says ,”When he came to his senses” and the KJV says, “And when he came to himself”. This is most often interpreted as “He repented”. If this phrase is understood as repentance, then the theological unity of the the three “lost” stories in Luke 15 has been broken. Repentance in the first two stories is merely the “acceptance of being found”. Both the sheep and the coin were hopelessly lost and could do nothing to find themselves. They had to be rescued by a hero figure (savior). If the prodigal manages to save himself and make his own way home by his own efforts, then the third story is the exact opposite of the first two. If he repents in the far country and struggles home on his own, theological confusion sets in and the reader is left to wonder what repentance really is. Can we return to God without His aid or does He have to come after us? The answer lies in the translation of that phrase, “He came to himself”. Middle Eastern and Arabic translations of this phrase paint an entirely different picture. They translate Luke 15:17 as , “He got smart”, “He thought to himself” and “He took an interest in himself”. They never thought of him as repenting and returning to his father, but returning to himself. In other words, the prodigal has to develop a plan to get himself out of this mess – and he does. What about his confession that he concocts in verse 18, “I have sinned against heaven and before you”? This is where our lack of knowledge of the Hebrew scriptures gets us in trouble. Well known to the Pharisees and teachers of the law who were hearing this parable was the fact that this is the exact same phrase that Pharaoh said to Moses in Exodus 10:16 when he was trying to manipulate Moses into stopping the plagues! Everyone knew that Pharaoh was not repenting! He just wanted the plagues to stop! The prodigal son’s statement that he had sinned was designed to produce the same result. He was trying to think of how he could soften the expected anger from his father and convince him to let him back on the family farm as an apprentice to one of his hired hands (see verse 19). There is no hint of remorse in his statements; he wants to eat! Evidently, his father’s hired hands made enough money to even have some savings as verse 17 indicates (bread enough to spare). If the son can recover the lost money through working for his father, then he could feel reconciled and would have worked his way back. This part of the story is so interesting and ties back to the salvation message because the son is trying to “keep the law” by working his way back to salvation. Grace is unnecessary if he can manage it on his own. The prodigal sees it only as matter of lost money, just a broken law. However, the real sin is the broken relationship with his father. The son has done everything wrong to this point. Now he has a plan to work himself back into the good graces of his father. In our next lesson we’ll see how his plan worked out. First, let’s look from a cultural perspective at the inheritance that the younger son asks for while his father is still alive and seemingly in good health. Evidently, the father was a man of some means and the inheritance would have involved land, animals, slaves, and other personal property. From our modern day, western perspective, the request for the inheritance certainly seems like a selfish request, but not one that is completely out of bounds. We conclude that he is a young lad who is anxious to make his way in the world, albeit too quickly. However, in traditional Middle Eastern Culture, to ask for the inheritance while the father is still in good health would be to say the the son is anxious for his father to die! He would have brought tremendous shame on himself and his family, not to mention the hardship of having to divide up tangible property and the working assets of the family business prematurely. It was a request that should have never been made and one that no middle eastern father would have agreed to. In fact, what the son was asking for would have been deemed foolish and unreasonable in almost any culture. Any human father would, of course, be expected to refuse his selfish son’s request. Instead, however, the father grants the son’s request. This unbelievably unselfish action elevates the father figure beyond what a human father would do and reshapes the father into a metaphor for God. This father is different from a human father. His love and compassion for his son knows no limits. This request for the early inheritance severs the relationship between the son and his father and only deepens when the son sells the family property. This broken relationship is the key point in the request for the inheritance. Next, let’s look at the stage on which this story is set. Often, this parable is seen as a story involving only the three main characters and nothing more. It is as if the story takes place on a high hill in total isolation, with only the father and his two sons in the play. However, in Bible times, agricultural land was scarce and family farms were not large. Farmers never lived on their farm land because you wouldn’t want to waste good farm land by building on it. Instead, people lived in small, compact villages called insulas and went out to work on their farms. These insulas were made up of family members and close relatives and everyone knew each other well. Children grew up around their grandpas, grandmas, aunts, uncles, and cousins as well as other neighbors. To understand this story in the proper context, we have to know that it took place in front of a watching community of family, relatives, and neighbors. To further cement this idea, think of the first two stories of the Lost Sheep and the Lost Coin. In both stories the community is called together for a celebration when the lost was found. All these stories took place in community, but in the Lost Son story it is assumed until the very end. With this knowledge of the facts surrounding the inheritance and the idea that the story takes place in a community, some interesting implications follow. When the young mans asks for his share of the inheritance and obtains it, he moves quickly to sell it off. The text says in Luke 15:13, “Not many days later, the younger son gathered all he had”. 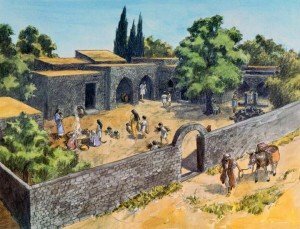 The Greek here implies that the son moved quickly and sold his inheritance, split the family farm, turned it into cash, and got out of the village as quickly as possible. By Jewish custom, at this point he would have been threatened to be disowned by the community. A ceremony called Kezazah (cutting off) would be performed if a Jewish boy lost his inheritance to a Gentile and he would not even be allowed to return or have anything to do with the community. The prodigal knows when he leaves that he better come back with all his inheritance money intact or he will face huge public shame and be completely cut off from his family and his past. To conclude this segment, we have learned how unusual and unthinkable it was for the son to ask for something that would cause so much pain and humiliation for him and his family. We have also learned how impossible and God-like it was for the father to go ahead and grant the request. However, in the process, the relationship between the father and the son was broken and his reputation in the community was damaged. In our next sessions we will look at the young son as he goes to the far country to make his fortune and the events that lead him to return home. We now turn our attention to the most well known of the the three lost and found stories in Luke 15, the story of the lost or prodigal son. No story in the Bible, or any other sacred literature presents such a dynamic and compassionate picture of our Father. For hundreds of years the Latin tradition has called this story, “Evangelium in Evangelio”, which means the gospel within the gospel. However, as we have mentioned in our past posts, the more familiar a story becomes, the more it takes on its own interpretation and special way of seeing the story develop that then become part of the text itself. The basis used to interpret Bible metaphors comes from the cultural assumptions of the story teller and his audience. Often, their world view is the standard from which conclusions are drawn as to what the Bible writers meant. That is why it is so important to place Bible stories into the culture in which they were originally written. Let’s look at the story of the Lost Son in light of the middle eastern culture in which it was written and see if perhaps there is some different conclusions that surface and some new light to be shed on this wonderful story. First, we need to identify some problems that seem to exist from a casual comparison of the Lost Son story with the Lost Sheep and Lost Coin stories that precede it in Luke 15. At first glance, the first two stories appear to be in conflict with the third. 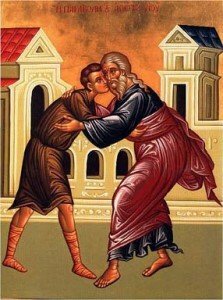 The parable of the prodigal son appears to have no savior! The prodigal , “came to himself”, in the far country and then went home. If God is the Father in the story, then it would seem that God passively waits for us to return home, but does not go after us like the good shepherd and the good woman went after their lost objects. In the first two stories the finder does all the work. The shepherd leaves the flock and goes after the lost sheep till he finds it. The lost sheep cannot find his own way home. In the same way, the good woman diligently looks for the coin until she finds it. The coin can do nothing to be found on its own. Yet, on his own, the prodigal comes to or finds himself and then heads home from the far country. Could this be correct? How can this be the gospel within the gospel as has been thought for centuries? Do these three stories conflict with each other? Can we come to God, unaided? Where is the seeker and saver of the lost, the ”word becoming flesh”, the heavy price to be paid, the mediator between God and humans and the savior that make up the “gospel” of the New Testament? More than a casual reading is needed if we are to unlock the hidden manna in this wonderful parable from our Messiah, Jesus. So, let’s get our spades and dig into the word and see what shows up. We will break the story into three parts and look at one part for each lesson. In the first lesson we will look at the, “Request for the Inheritance”; the second, “Returning Home”; and third, “The Banquet and the Older Son”. Then we will try to draw some conclusions. Stay tuned for Part 1 next week.